Back to Laser Experiments and Projects Sub-Table of Contents. This chapter provides a variety of suggestions for experiments and projects using lasers ranging from trivial to quite advanced. Some utilize the optical properties of the laser beam like its ability to be well collimated or highly focused while other depend on the unique coherence and monochromicity of the laser light itself. And still others take advantage of the ability to modify or control the lasing process via intra-cavity optical components, magnetic fields, or other mechanisms. Currently, they are just suggestions. (If you can't wait, there are also some links to Web sites with educational laser projects below.) Eventually, additional details of the setup and required supplies will be added. Where the particular topic is already discussed elsewhere in Sam's Laser FAQ, a link to that section will be provided. However, in most cases, at least some of the details will be left as an exercise for the student. What fun or challenge would it be if we told you everything? After all, besides its educational value, hands-on experience should indeed be both fun and challenging! However, where more information is available in this document, links are provided. A 1 to 5 mW internal mirror helium-neon laser will be suitable for most of the basic experiments (though a somewhat higher power one would be better for those like holography). It should be possible to procure such a laser for under $50, possibly under $25 depending on your resourcefulness and scrounging abilities. Alternatives like bare laser diodes and appropriate drive circuitry may be more desirable for projects like laser communications where modulation is required. And, other color lasers (than the boring red HeNe or laser pointer) will be desirable for laser display. See the chapter: Laser and Parts Sources. I also have a variety of suitable lasers and components available on Sam's Classified Page. A tutorial from Electro Optics Associates, whoever they were. My apologies if they evolved into one of the major laser manufacturers! This booklet was apparently provided along with an early external mirror HeNe laser (LAS101) for educational purposes. This had a wide bore tube running on only 300 VDC with a resonator length of about 14 inches. The mirrors could be interchanged to produce a multimode or TEM00 beam. While this is from a booklet dated 1965 (!! ), all the experiments are still quite valid. The CORD Lasers and Electro-Optics Courses. See the section: On-Line Introduction to Lasers for the current status and on-line links to these courses. Various miscellaneous places including USENET newsgroup postings and my hazy recollection of fun things that I have done in the past. All of these experiments can be performed with a fully enclosed 1 mW HeNe laser (or laser head and power supply) which poses minimal risk to vision and no shock hazard from even gross carelessless (though not totally, perhaps, from deliberate abuse). However, some, like those dealing with holography, could benefit from a 5 mW or larger laser. Higher power lasers, especially those above 5 mW, need to be treated with great respect as even momentary eye exposure can cause permanent damage to vision. In addition, those experiments requiring access to the interior of the resonator of an external mirror laser may expose the user to potentially lethal voltages in the vicinity. If possible, any exposed high voltage terminals should be well insulated or blocked from accidental access. And, where all you have is an exposed HeNe laser tube and separate power supply, building all this into a safe enclosure is highly recommended. Read the chapter: Laser Safety in its entirety and follow its guidelines - particularly in regards to the safety of others who may not be as aware as you in dealing with your equipment. Diffraction and dispersion (diffractions gratings, prisms). Comparison of normal and coherent light (speckle, interference, monochromicity). Common lasers: diode, HeNe, pulsed Nd:YAG, DPSS doubled YAG (green laser pointer). Open cavity helium-neon laser (access to internal photon flux, mirror alignment, modes, variable angle window). Holography (readout and visualization of displacement/vibration). Laser display and light shows (audio and PC generated graphics). Free space and fiber optic laser communications (audio and video). LaserFX.com - Laser Science Projects. Metrologic - More Than 101 Ways to Use a Laser. As of Fall 2004, Industrial Fiber Optics has taken over Metrologic's educational laser operation so this link may move (or may have moved) there. Also see the chapter: Laser Information Resources. When neutral density filters are placed one after the other, their ND numbers (-log attenuation) add. So two ND1 filters (T = .1) in series results in a equivalent ND2 filter (T = .01). Now, what happens if multiple dielectric mirrors are placed in series? Under certain condition, more light will get through than might be expected. For example, using the same example as above, if T = .1 for both mirrors, the resulting output may actually be as high as for an equivalent mirror with T = .05 (rather than T = .01). Why? Under what conditions will this happen? How does the T factor of each mirror affect this behavior? What other factors are important? This just requires a pair of narrow closely spaced slits, a laser pointer or HeNe laser, and a screen or white card onto which to project the resulting diffraction pattern. The main problem is in getting the slits to be narrow and close enough together to obtain a nice wide pattern. I once made a two slit experiment using a piece of glass, two razor blades, some tape, and some water based acrylic paint. First I painted the glass with the paint. I chose a dark green color which absorbed my HeNe light pretty well. To make a smooth single layer of paint I put two parallel strips of Scotch tape on the glass about 1/2 inch apart. Then I placed a drop of paint towards one end of the channel formed by the two pieces of tape. With a razor blade resting on the tape, I dragged the blade along the channel thus spreading a nice thin even coating of paint along the glass. With practice on how much pressure to apply I was able to get a very good strip of paint that wasn't too thick or thin. While the paint dried I taped two razor blades stacked together. To get the razor edges closer together than the thickness of the blades I used a small piece of folded paper at the back edge of the blades so as to fulcrum the sharp edges of the blades closer together. Once the paint was dried I quickly dragged the two points on the corner of the joined blades across the paint strip thus creating two parallel slits. With practice on applying the paint, adjusting the gap of the blades, amount of pressure when scoring the paint, etc... I was able to successfully make two slits close enough that a raw beam from my 5 mW HeNe pointed at the two closely spaced slits caused diffraction in the far field. It was quite fun and was very useful for demonstrating the wave nature of light. More information with photos can be found in a link from: Skywise's Laser Picture Gallery. The objective here would be relate the visible wavelengths in the discharge inside the bore to the actual output wavelengths. For example, while red at 632.8 nm is the strongest of the visible HeNe wavelengths, it is a relatively weak line int he discharge. A long HeNe laser with external interchangeable or multi-line optics, or a tunable (e.g., PMS/REO) HeNe laser would be best for this experiment. See the sections starting with: Viewing Spectral Lines in Discharge, Other Colors in Output. These require access to a laser with at least one external mirror. The usual choice would be a modest size lab type HeNe laser. Unfortunately, these aren't the sort of thing one typically has at home. And, even if you find one, it may not be convenient (or permitted if it isn't yours!) to gain access to the cavity. However, it is possible to put together something that is every bit as good for minimal cost using a HeNe laser head with an internal HR mirror and Brewster window at the other end. A HeNe laser power supply and easy to construct mirror mount completes the assembly which provides full access to the inside of the cavity between the Brewster window and external mirror. One-Brewster HeNe tubes and laser heads are available on the surplus market but you may have to ask. As an example of such a laser head, see the section: A One-Brewster HeNe Laser Tube. A complete laser using this laser head is described in the section: Sam's Instant External Mirror Laser Using a One Brewster HeNe Tube. One-Brewster tubes, heads, a complete kit with power supply, as well as a mirror assortment, are available on Sam's Classified Page. Locate a HeNe laser tube with an HR mirror that doesn't have any wedge and characterize its behavior. See the analysis in the section: Melles Griot Yellow Laser Head With Variable Output. See: Perpendicular Uncoated Windows in a Low Gain Laser. The setup described in the section: Mirror/Optics Test Jig Using One-Brewster HeNe Laser Tube may be used to perform a variety of experiments requiring access to the inside of an adjustable length resonator using various mirrors or other optics. With the commonly available one-Brewster HeNe laser tubes like the Melles Griot 05-LHB-570, either multimode or single mode operation is possible depending on the external configuration. How does the mode structure vary with L? How does the mode structure vary with OC curvature? How does the mode structure vary with OC alignment? How is the sharpness of the mode structure affected by OC quality (e.g., comparing a laser mirror to a barcode scanner mirror)? How does the divergence vary with L? Can a positive lens always focus the multimode beam to a small spot? How does the profile of the intra-cavity beam (mode volume) change with L? What effect does a variable stop (iris), knife edge, or arbitrary pattern placed inside the cavity have on the output beam? How is this affected by position? What about at the Brewster window or OC surface? How does output power vary with L (assuming the OC alignment is tweaked for maximum power at each location)? Why does that absolutely fascinating thing happen? The optogalvanic effect is a phenomenon whereby the electrical conductivity of a gas discharge is affected by light (generated or external) that is resonant with an atomic or molecular transition of the elements within it. One application is in spectroscopy whereby gas composition can be determined by illuminating the discharge a tunable light source while recording its voltage or current. More information can be found at the International School of Photonics Optogalvanic Page. The optogalvanic effect can be observed even with a normal HeNe laser without external illuviation. As the tube warms up, the longitudinal modes shift through the gain curve and and the output power - and thus the intracavity power - changes depending on where the modes are. For long healthy tubes, the change is small. But for short tubes especially where the output power typically varies by 20 percent or more, it is easy to see as the sustaining voltage changing in synchrony with the power fluctuations. If the HeNe laser power supply is constant current, as with most commercial units, the sustaining voltage will have to be monitored. Connect an oscilloscope through a 10 nF or larger high voltage capacitor to the top of the ballast resistor. Even being AC coupled, the voltage will be seen to move up and down perhaps a few 100s of mV or more as the power changes. CAUTION: Make sure the scope input is protected from the high voltage!!!! :) I use an NE2 neon lamp across the scope input to limit the voltage to 90 V even during transients. If the power supply is unregulated, then the current will change as the tube's sustaining voltage changes, and this can most easily be monitored as the voltage across a resistor in series with the tube's negative return. A Scanning Fabry-Perot Interferometer (SFPI) consists of a pair of partially reflective mirrors. The laser under test (LUT) is input to one end and a photosensor is mounted beyond the other end. The coarse spacing and alignment of the mirrors can be adjusted by micrometers. The axial position of one of the mirrors can be varied very slightly by a linear PieZo Transducer (PZT). By driving the PZT with a triangle waveform and watching the response of the photosensor on an oscilloscope, the longitudinal modes of the LUT can be displayed in real time. In essence, the comb response of the SFPI is used as a tunable filter to analyze the fine detail of the optical spectrum of the LUT. As long as the FSR (c/2*L) of the SFPI is larger than the FSR of the LUT (i.e., the SFPI cavity is shorter than the LUT cavity), the mode display will be unambiguous. 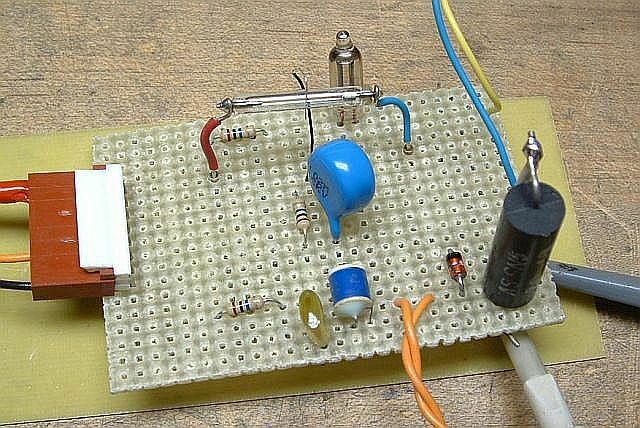 Assuming a function generator and oscilloscope are available, it is possible to build an SFPI that demonstrates basic principles for next to nothing, or one that rivals the performance of commercial instruments costing many thousands of dollars for less than $100. See the sections starting with Sam's $1.00 Scanning Fabry-Perot Interferometer. Even this very simple SFPI using salvaged mirrors will easily resolve the longitudinal modes of a HeNe laser. I offer sets of mirrors suitable for a confocal HeNe laser mode display SFPI. See Sam's Classified Page under "HeNe Laser Kits". Monitor the leakage (waste beam) from the HR of a common HeNe laser tube to detect sub-wavelength changes in the distance from the OC to an external mirror. By adding an external mirror or grating to a conventional internal mirror red or other color HeNe laser tube, it is usually possible to get anywhere from 1 to over a dozen other lasing wavelengths to appear. With am aluminized or dielectric mirror next to the OC, even a 1 mW red (632.8 nm) tube will probably give 1 or 2 additional red lines. With a 3 to 5 mW tube, 4 or 5, or even more may be produced. Some of these are not normal HeNe laser lines and their existence is not widely known. In fact, being able to do this overall experiment isn't something that's widely known. See the section: Getting Other Lasing Wavelengths from Internal Mirror HeNe Laser Tubes. Commercial, very expensive stabilized HeNe lasers are actually quite simple in principle and can be built from mostly junk parts. With care, the performance of these systems can rival that of units costing thousands of dollars. All that is needed is a short HeNe laser tube to which a heater has been added, some optics and photodiodes to sample the amplitude of either one mode polarization or two mode (orthogonal) polarizations, and some basic electronic components to implement the control loop. See the section Inexpensive Home-Built Frequency or Intensity Stabilized HeNe Laser for more information on what's involved. I may be able to provide a set of parts including a well behaved HeNe laser tube, HeNe laser power supply, beamsplitter(s), photodiodes. Some mechanical skills will be required to mount everything. The electronic components can be obtained from places like Digikey or Jameco. Using a 5 mW or larger TEM00 polarized HeNe laser and high speed silicon photodetector, it is possible to monitor the difference frequencies resulting from longitudinal mode beating as well as the differences of the difference frequencies, which are non-zero due to mode pulling. See the sections starting with: Longitudinal Modes of Operation. For looking at the longitudinal mode beating, a photodetector and oscilloscope with a response beyond c/2L for the HeNe laser will be required. This would be 500 MHz for a 12 inch long tube (mirror to mirror). So a longer tube would be desirable both due to its lower beat frequencies and more modes. For the second order difference frequencies, the photodetector still has to be fast but the scope only needs to respond to 100 kHz or so. The setup is similar to that for longitudinal modes beating, above, except that a multimode (non-TEM00) HeNe laser is required. The response of both the photodetector and oscilloscope only needs to be a few MHz since transverse modes are quite close together in frequency. A lens may be needed to force overlap of the mode spots since they won't mix if falling on separate areas of the photodetector. 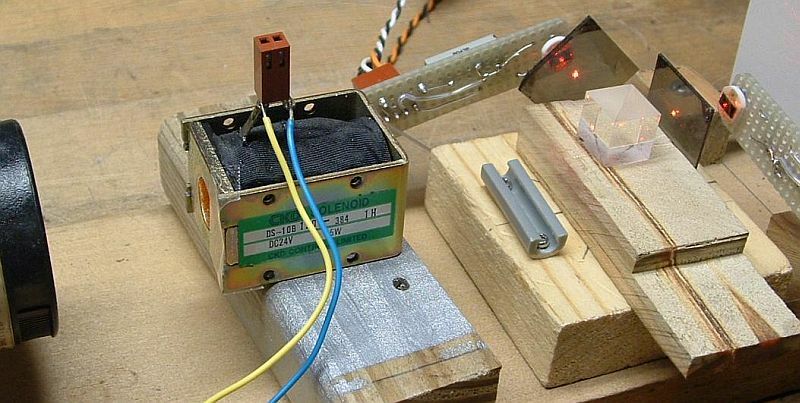 Experiments that explore the effect of a magnetic field on the behavior of a HeNe laser can be extremely fascinating for a hobbyist-experimenter type. This is due to how dramatically the fundamental operation of the laser with respect to longitudinal modes and polarization are affected by external permanent magnets or an electro-magnet. In addition to a 1 to 2 mW random polarized HeNe laser, only very basic equipment and common low cost readily available optics and electronic parts are needed. Data can be recorded using a $25 PC-based data acquisition system or even a simple chart recorder. There are at least two arrangements primarily differing whether the magnetic field is oriented along the optical axis of the tube (axial) or perpendicular to it (transverse). Of course, no law prevents experimenting with the field at other orientations! All that is needed to explore axial Zeeman splitting is a random polarized HeNe laser tube (5 to 6 inches is probably optimal) and power supply, a ring magnet into which the HeNe laser tube can be placed producing an axial magnetic field (or electromagnetic solenoid), a photodetector with a response to a couple of MHz, and an oscilloscope. See the section: Two Frequency HeNe Lasers Based on Zeeman Splitting for more information. HeNe laser tube: Suitable choices are tubes from Hewlett Packard model 5501 or 5517 laser heads (with or without output optics but including the original ring magnets), or home-built versions of these using common non-polarized 5 or 6 inch barcode scanner HeNe laser tubes with powerful ring magnets polarized N-S along their axis. HeNe laser power supply: This can be the original one that went with the laser but it is not critical as long as the tube current is reasonably close to its specification. For these small tubes, 3.5 mA is usually adequate. Polarizer: Any material or optic that will act as a polarizer at the red 632.8 nm HeNe laser wavelength. The usual choice would be a piece of a linear polarizer sheet. Photodetector: If the laser tube came from a commercial laser head, the best choice is the photodiode and preamp board that was also present there as it will have an AGC circuit and comparator to cleanup the detected signal. Otherwise, any silicon photodiode can be used with reverse bias to improve the frequency response. If there is no AGC, some means of adjusting the beam intensity incident on the photodiode will be required. This can be as simple as moving the beam position so only a portion of it hits the detector. Oscilloscope and/or frequency counter: Anything with a bandwidth of at least 5 MHz will suffice. Set up the components in a reasonably stable manner. The polarizer just needs to be in the beam - its orientation doesn't matter since it's simply converting circular to linear polarization. Using a scope (preferably) or frequency counter, look for a beat frequency from the detector. The HP 5501 tube is very stable - its frequency will only vary by a few percent over several minutes. The frequency of the HP 5517 tube varies quite widely in a periodic manner as mode cycling takes place due to heating. The beat may disappear totally during part of the cycle. This behavior is very similar to that of the home-built version. Adding some means of cavity length stabilization would be the next step. Experiments can also be performed without the tube inside the ring magnets by trying various positions and orientations of external magnets. It may even be interesting to put the output through an audio amp and speaker as the beat frequency with a smaller magnetic field will cover the audio range. Transverse Zeeman Stabilized HeNe Lasers. HeNe laser tube: Suitable choices are common longer barcode scanner tubes like the Melles Griot 05-LHR-088, Spectra-Physics 088, Uniphase 098. These are about 9.5 inches in length and are probably optimal in their longitudinal mode spacing. Shorter tubes will have a limited range (magnetic field strength and portion of mode sweep cycle) where a beat can be observed. Longer tubes may similar problems but due to too many modes being present. HeNe laser power supply: This can be the original one that went with the laser but it is not critical as long as the tube current is reasonably close to its specification. Polarizer: Any material or optic that will act as a polarizer at the red 632.8 nm HeNe laser wavelength. The usual choice would be a piece of a linear polarizer sheet. Additional polarizers will be needed if it is desired to also observe the polarized mode amplitudes. Photodetector: At the expected beat frequency in the 10s to 100s of kHz range, almost any silicon photodiode can be used with reverse bias to improve the frequency response. Some means of adjusting the beam intensity incident on the photodiode will be required. This can be as simple as moving the beam position so only a portion of it hits the detector. Oscilloscope and/or frequency counter: Anything with a bandwidth of at least 1 MHz will suffice. Set up the components in a reasonably stable manner. It will be necessary to determine the natural polarization axes of the tube. Orient the magnets their field parallel to one of the axes and the polarizer at 45 degrees to one of the axis. Using a scope (preferably) or frequency counter, look for a beat frequency from the detector. Depending on magnetic field strength (i.e., how many magnets are used and how close they are to the tube), there will be a beat signal over part or all of the mode sweep cycle. Experiment with various configuration of the magnets. To observe the polarized mode amplitudes, some additional optics for beam sampling will be required, along with photodiodes and possibly some simple electronics and a low speed data acquisition system to record the data. This type of laser can also be frequency stabilized since the beat frequency varies with mode position. A Phase Locked Loop (PLL) is generally used but a simple Frequency-to-Voltage (F-V) converter and op-amp will work in a manner similar to that of the polarized mode stabilized lasers. The Faraday effect or Faraday rotation is an interaction of electromagnetic waves with a magnetic field in transparent dielectric materials. In simple terms, the polarization of the beam is rotated by an amount and direction proportional to the Verdet constant for the material times the component of the magnetic field in the direction of propagation times the length of interaction. So, the simple (non-integral) equation would be: β = VBd, where β is the rotation angle, V is the Verdet constant, B is the component of the magnetic field along the direction of propagation of the beam, and d is the interaction length. Many common materials like Nd:YAG have a small Verdet constant, though it is still sufficient to enable a strong magnet to produce enough of an FR effect to be used in forcing unidirectional operation of a ring laser. However, there are some special materials with very large Verdet constants. Terbium-doped glass has V = 65 deg/(T*cm) (T = Tesla = 10,000 gauss). And Terbium Gallium Garnet (Tb3Ga5O12 or TGG) has a Verdet constant about twice as large. To put this in perspective, a 2 cm long rod of terbium-doped glass will rotate the polarization by 10 to 20 degrees if inserted inside a stack of two ferrite magnetron magnets. Even a "refrigerator" magnet of around 100 gauss will result in a detectable effect if the rod is between crossed polarizers or a polarizer is used with a linearly polarized laser. And 100 degrees or more is possible using a tabletop magnetic pulser. See the next section. OK, this isn't in the "can crusher" or "rail gun" category, but it's capable of a 1 Tesla pulsed field inside a small coil. That probably could be used to "charge" ferrite and AlNiCo magnets, and maybe some types of rare earth magnets. Well, that is, if they are quite small. The bore is only about 3/8" in diameter. 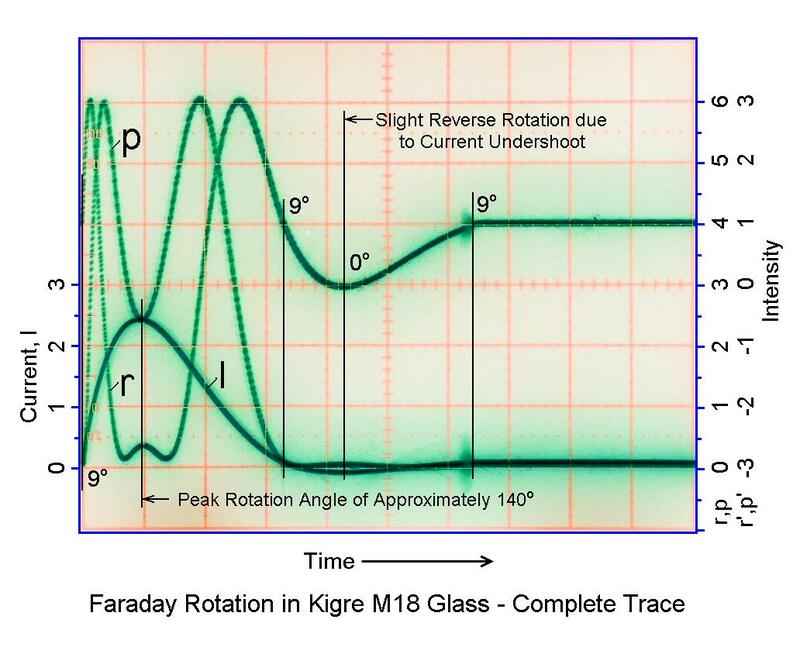 See Overall System for Testing Faraday Rotation in Kigre M18 Glass Rod. WARNING: The energy stored in this capacitor bank can be quite lethal. It's greater than that for a microwave oven capacitor. The flashlamp has a self breakdown voltage of about 2,500 V so it alone can make a really big relaxation oscillator. But, the breakdown voltage is not nearly as consistent as with an NE2 neon lamp, so the rate of flashing using self-breakdown was highly erratic. So I used some of the remaining components from the flash unit to provide a manual trigger. The voltage for the trigger capacitor is taken across the bottom bleeder resistor. The single flashlamp is marginal at 2,500 V since it likes to fire on its own - two in series would probably be better. But this way, it lets me know not to try to push my luck at higher voltage. Most of my subsequent tests were done at just under 2,500 V so that it would not flash on its own. Charging requires about 15 seconds which results in a conservative average power for the solenoid, which would be the limiting component. See Photo of Magnetic Pulser Flashlamp Switch and Trigger Circuit. The neon bulb will be lit when there is more than 60 V across the flashlamp so it serves as a danger indicator. The large blue capacitor isolates the trigger wire from the trigger transformer so that even if the flashlamp arced to the trigger wire, it wouldn't go any further. And note that the trigger wire isn't even near the flashlamp. When any closer, the flashlamp would self-fire at less than 2,000 V. The large black cylindrical object is the 0.2 ohm current sense resistor, with a scope probe and ground clip visible attached to it. The yellow and blue wires go to the pulser coil and the orange wires go to the remote trigger pushbutton. The pulser coil is from an actual magnetic solenoid used to actuate some sort of something or other. ;-) It was carefully selected because the bore size was correct for what had to go into it. :) With the rear pole piece drilled out and removed, it has a nice magnetic yoke to complete the magnetic circuit outside the bore of the solenoid. It's pure luck that this sort of thing survives being pummeled with pulses of nearly 2,500 V, as its normal operating voltage is 24 VDC. But so far so good. I'm determining the magnetic field using a special type of magneto-optically active glass (M18, available at exorbitant cost from Kigre, though I'm sure if it's a listed product, mine is a sample on loan). This material exhibits a strong Faraday effect, rotating the polarization of a beam of light in proportion to the axial component of the magnetic field. The sensitivity of the Faraday Rotation (FR) in M18 is about 123.5 degrees per Tesla (10,000 gauss) for the 1.9 cm long rod. And, at nearly 2,500 V, I'm exceeding 1 T.
The very high class optical setup is shown in Optical Setup for M18 Faraday Rotation Experiments. Now these are true optical breadboards! :) It consists of a polarized 5 mW HeNe laser, the M18 rod (hidden inside the hole in the solenoid - note the piece of clear tape to prevent it from falling out accidentally if the solenoid is tipped! ), a Melles Griot non-polarizing beamsplitter cube followed by a piece of Polaroid-type linear polarizer for each exit, and a reverse biased $2 photodiode with a 3.3K ohm load resistor. While using a polarizing beamsplitter to obtain orthogonal vertically and horizontally polarized outputs might be expected and is often used in similar experiments, this is not optimal. Why? Because they don't provide much additional information compared to a single signal, being essentially complements of each-other. Having multiple signals may help reduce noise and eliminate offsets due to non-polarized light. However, they don't permit the determation of the direction of rotation if the input polarization is initially aligned with one of the polarizers (e.g., 0, 90, 180, or 270 degrees), or make it possible to disambiguate a change in rotation direction that may occur near one of these angles. The outputs of the photodiodes (PDs) go to the two channels of an analog scope, which unfortunately has no storage capability. This is one time I'd prefer a digital scope or data acquisition system! The trigger comes from a current sense resistor of 0.2 ohms, which was also used initially to determine the actual current in the coil. Since the scope has a "trigger view" function, the current (I) can be displayed as a third trace, since it is already used for triggering. With the 5 uF energy storage capacitor bank, the pulse duration is about 2.5 ms and the system is just slightly underdamped. The peak current is 12 to 13 A into a coil with a resistance of 120 ohms. Based on the dimensions and resistance of the coil, it has approximately 2,700 turns of #32 AWG wire, producing more than 32,000 peak A-T. (This was found using the equations in the section: "Estimating the Number of Turns of Wire in a Coil" in the document: "Notes on the Troubleshooting and Repair of Small Household Appliances and Power Tools" of the Sci.Electronics.Repair FAQ.) However, the large number of turns results in a high inductance which is far from ideal. A smaller number of turns of thicker wire would be much better but scroungers can't always be too selective. For example, if there were 1/4 the number of turns of wire with 4 times the cross-sectional area, the resistance would be 1/16 and the current could be 16 times larger with the ampere-turns being 4 times as large so the magnetic field would be larger (subject to saturation effects of the iron of the yoke). This might be a bit much for the flashlamp from a disposable camera, but not for a larger one. Rewinding the solenoid might be possible but the yoke is not designed to be easily disassembled. While the energy of the capacitor at 2,500 V is about 15 Joules, most of this is dissipated in the coil so the flashlamp isn't being stressed. I'd guess the dissipation there is under 1 Joule. Using the actual value of the current of 12 A measured with the 0.2 ohm sense resistor, the dimensions of the coil, and an estimate of the number of turns, the resulting magnetic field is 1.3 T, which is remarkably close to the measured value of 1.1 T considering all the assumptions and hand waving. :) There should be inaccuracies introduced because this coil has multiple layers and because there is an iron yoke completing part of the magnetic circuit. The plot above shows the complete event except for the very tail of the current pulse. The three traces are the current, I (scale on the left) and r and p optical power (or intensity, scale on the right). A scale for signals r' and p' (to be described below) is also provided on the right. The units are arbitrary, based on the scope graticle. I believe the slight skew between r and p is a combination of the linear polarizers not being oriented at exactly 45 degrees and the beamsplitter cube transmission and reflection being slightly polarization-dependent even though it's supposed to be non-polarizing. The response of the M18 glass is very fast - probably in the 100s of GHz range if not higher - so that is not an issue here since these pulses are on the order of milliseconds. Note that the electrical system is slightly underdamped so the current, and rotation angle, go a bit negative near the end. 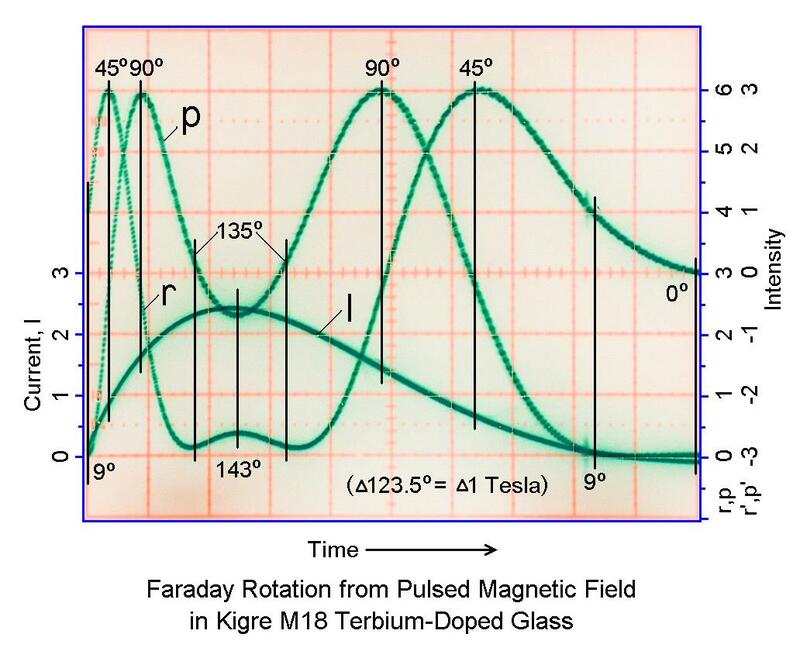 Faraday Rotation in Kigre M18 Glass - Complete Trace shows all the gory details. (Note that this is a different shot so the values are not quite identical.) When the current is descreasing and crosses zero going negative, the flashlamp is still conducting. But when the current attempts to cross zero going positive, the flashlamp apparently cuts off and thus the glitch before it flat-lines. Note that the magnitude of the negative current is quite small - less than 5 percent of the peak - but since r is changing rapidly at around that point, it looks a lot worse than it really is. The two pin connector attached to the solenoid terminals (visible in the photo) was intended for a snubber circuit to eliminate the undershoot, but it never was installed. 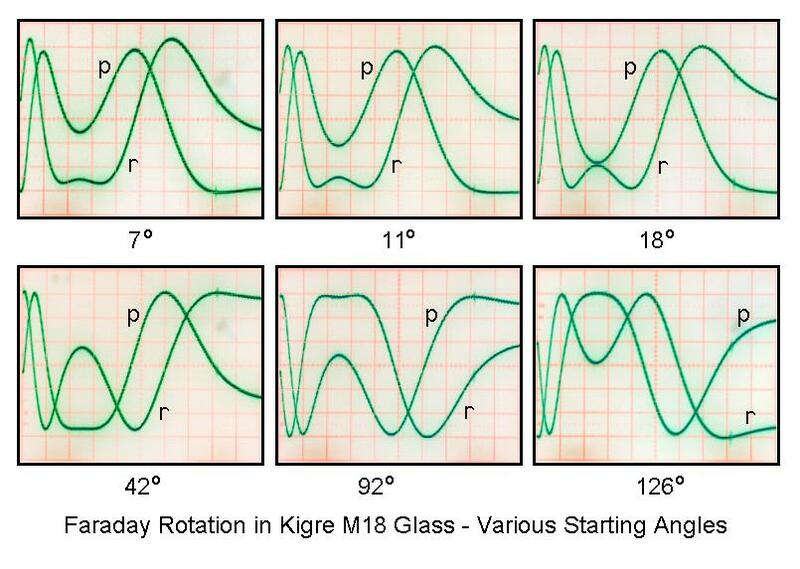 And, see Faraday Rotation in Kigre M18 Glass - Various Starting Angles for the appearance with the a bunch of randomly selected input polarizations, obtained by rotating the HeNe laser. :) (No effort was made to assure that the gain and offset of the r and p signals were exactly the same in each case, so they aren't.) Using a Half Wave Plate (HWP) in front of the laser to set the initial polarization angle, and for adjustment of the polarizers and detector electronics so the signals are precisely orthogonal and have equal gain and offset, would be better than rotating the entire laser since it will have no effect on beam alignment. However, the HWP would have to be closely matched to the laser wavelength to maintain pure linear polarization. Malus' law relates the intensity of light passed by a polarizer to the angle between a linearly polarized input beam and the polarizer, or equivalently, to the angle between polarizers if using non-polarized light. where Io is the intensity at 0 degrees and I is the actual intensity. where r and p are the actual photodetector signals with a minimum value of 0 and a maximum value of Io. Note that this assumes both signals have the same minimum value (0) and maximum value (Io) as in the plot, above. Otherwise, appropriate adjustments should be made to eliminate any offset(s) and to make their scaling factor the same. I in fact did this by adjusting the vertical channel position and gain controls on the scope before taking the shots. This was done by rotating the laser to set the minimum and maximum on the display to be the same for both signals. Where they have already been captured, "adjustments" will need to be done on the data. This is left as an exercise for the student! This angle doubling is what results in 45 degrees being the required quadrature angle between r and p.
Both equations are subject to the condition that the rotation function must be continuous. A value of +/-(n*90) or +/-(n*180) degrees may need to be added to theta to achieve this since the arctan function can fall into the wrong quadrant. The values for r', p', and current (I) are from the plots and not volts or amps! And they were only slightly fudged. :) Due to the small skew in the r and p polarizers, I had to estimate some values where one of the signals was changing rapidly and didn't line up with the other as expected. In principle, I could go back and reshoot the data but that isn't going to happen! I was also trying to reconcile my inability to match up the magnetic field from the r and p signals compared to the magnetic field predicted by based on current. Then I realized that there is real hysteresis in the response of the solenoid's magnetic field with respect to the current. The magnetic field lags behind the current. So, the actual magnetic field (from r and p) is smaller than what would be predicted based on ampere-turns when the current is increasing and larger when the current is decreasing. Interesting. It's also possible that some or all of the hysteresis is in the response of the M18 glass to the magnetic field but based on what is found in the literature, this doesn't seem very likely. The reason I got involved is that a grad student at Cornell is using the stuff to measure high magnetic fields in plasma physics experiments and I decided I wanted to play as well. The peak magnetic fields involved in the research are only about 50 percent greater than what I have achieved, but the pulse duration is shorter by nearly 4 orders of magnitude. This requires more expensive detectors, high speed data acquisition, and super shielding in the vicinity of million amp current pulses, but is fundamentally the same problem. I will describe the actual details in the future. :-) But for now, see Magnetic Field Measurements in Wire Array Z-Pinches (Poster) and Magnetic Field Measurements in Wire Array Z-Pinches and X-Pinches (Paper) if you are curious. But more recent results are far more convincing. The circuit below will activate a relay (K1) when dark. It will easily detect a laser pointer after many bounces from mediocre mirrors, a flashlight, 100 W bulb at several feet without a lens, etc. All components are probably available from Radio Shack, certainly from DigiKey or Mouser. The only not totally common parts are PD1 and K1. I used a Photonic Devices, Inc. part number PDB-V107 (about $2 from Digikey) for PD1. This has a nice large active area of 17 mm but almost any silicon photodiode will work including those salvaged from computer mice and barcode scanners. K1 is a low current relay from Radio Shack but I don't know if it is still listed in their current catalog. There is nothing critical in this circuit. Basic experiements can be performed with just a laser pointer, solar cell, and audio amp. However, keep in mind that to really get any decent performance is not a trivial undertaking. Sound is likely to be distorted and noisy with contributions from both inside and outside. And just getting enough optical return off a window unless at precisely normal incidence will be a challenge in itself. Here is one link that appears to have rather detailed information: Laser Microphone. Ever since I first ripped apart a laser printer I've known that those spinning mirrors and weird optics would be perfect for a laser oscilloscope, but I didn't have any lasers powerful enough and didn't really know where to begin, so the idea just kept rattling around in my head. Until now. A while ago I came upon a cheapo video DVD-burner with a fried PSU. That was the laser I'd been waiting for. And largely thanks to this amazing site, I found out how to use it. The thing is built around a square rotating mirror sweeping the laser beam, a few flat lenses pulling the sweep together to about 30 degrees, and a speaker voice-coil tilting a long narrow mirror around a hinge. Bror Westblad's Mark-I Laser Oscilloscope Optical Path. Through the "Amplified Ear" AGC amp from RED Free Circuit Designs, a microphone picks up any sound in the room and displays it on a nervous red line on the wall. The effect is quite eerie, but on a well lit gallery wall it doesn't have quite the visual punch I was hoping for. It appears that even a painfully bright laser spot becomes rather feeble when stretched out to a two meter long line. So, I ended up building that super simple LM317 PSU. And now it works. But, I've no idea how much current I can feed the laser. The thing is, when I turn the power up, the output increases smoothly and I don't really see any distinct threshold. At 60 mA the output is about as bright as from a regular 1mW laser pointer. When I initially tested the laser with the batteries it drew 84 mA, so I guessed that to be some sort of max limit. So, in the final assembly, I adjusted the current to 81 mA. 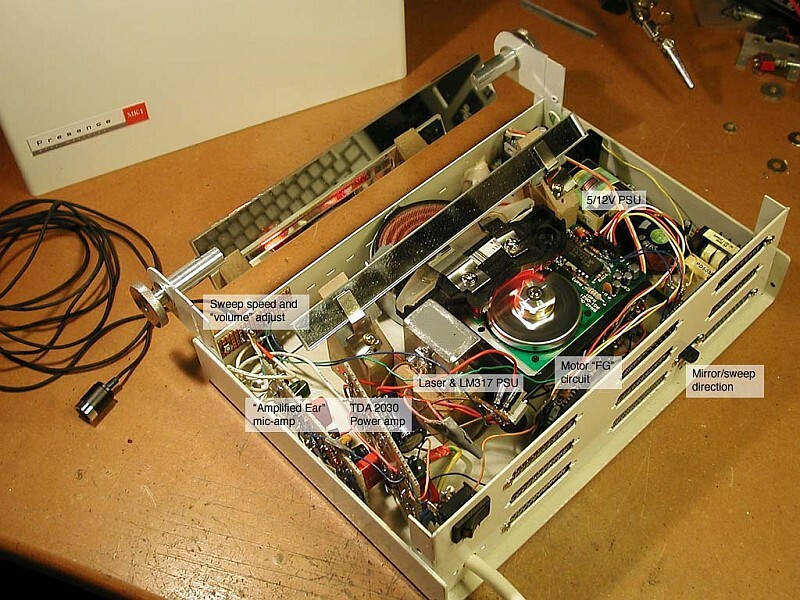 Bror Westblad's Mark-I Laser Oscilloscope with Cover Removed is an annotated photo of the completed unit. You were quite lucky (assuming that it wasn't damaged by the initial test with the two Alkaline cells! The 84 mA just happened to be all the pooped out battery could deliver. There is no real way to know what the upper limit is without either knoing the LD part number, or destroying a few. But many DVD burner LDs go up to 100 mW or more. Conway's "Game of Life" is not really a game but a cellular automaton where each successive generation of each point in an array is a specific function of its local neighborhood in the previous generation. Google for "Conway's Game of Life". One of my students built a real time (60 iterations per second on a 512 x 512 grid) implementation using conventional video technology about 20 years ago. When displayed in this manner, the appearance can be truly mesmerizing. This would be a natural for a laser display. The dimensions would not be restricted to common video formats but could be anything reasonable. While custom digital hardware including a full frame store had to be built 20 years ago to produce a real-time update rate, nowadays, a modern PC may be fast enough to result in an acceptable presentation. A typical front surface aluminized mirror reflects about 90 to 95 percent of the light so there can be quite a few bounces before the beam loses so much intensity as to be undetectable. However, the quality of the mirror is also important so as not to distort or scatter the beam. Sources for these mirrors include barcode scanners and laserprinters. Back surface mirrors are considerably worse than front surface mirrors. Dielectric mirrors coated for the specific laser wavelength are by far the best, some reflecting 99.999 percent of the light. Forward to Laser Information Resources.